Rumford Dollhouse: Four-room dollhouse made in the early part of the 19th century for twin sisters living in Philadelphia. The house passed through several generations of the same family until it was given to the Folk Art Museum. All of the furnishings are original to the house, but span the years of ownership by the Morris-Canby-Rumford family. Photo: Colonial Williamsburg Foundation. Exhibit designers kept their young guests in mind when creating this display. Objects have been installed at the viewing height of a 10-year-old child. 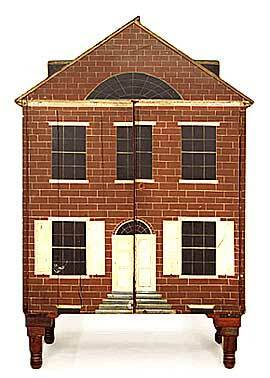 Two treasured dollhouses -- the Long Island and Rumford Dollhouses -- are featured. 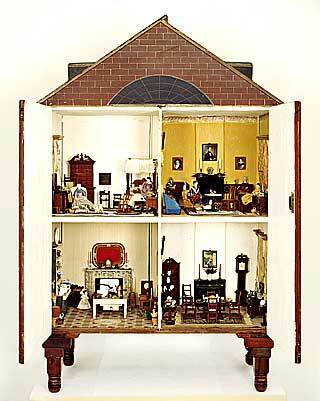 Found in Long Island, N.Y., the Long Island Dollhouse was made around 1900 and measures over 12 feet in length. 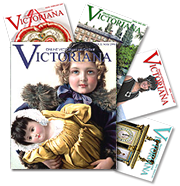 Its furnishings consist of pieces from 19th and 20th centuries. 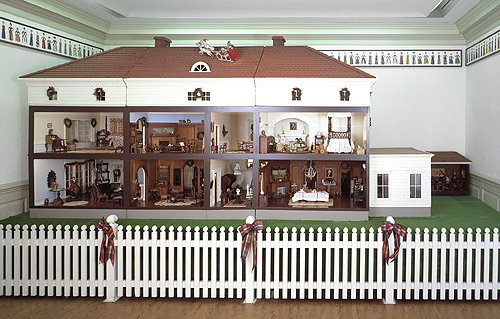 The Rumford Dollhouse features four rooms and was made in the early part of the 19th century for twin sisters living in Philadelphia. The house passed through several generations of the same family until it was given to the folk art museum. All of the furnishings are original to the house. Long Island Dollhouse: This impressive dollhouse was made around 1900 and measures over twelve feet in length. It was found in Long Island, New York. The furnishings consist of pieces from the nineteenth and twentieth centuries. Photo: Colonial Williamsburg Foundation, Williamsburg, Va. 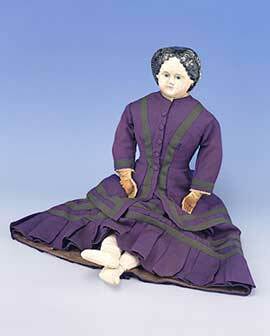 Dolls have been popular toys for girls through the centuries. In this exhibition, Gretchen was a cherished member of the Clymer-Rumford family. She was made in Philadelphia by the Greiner firm in the last quarter of the 19th century. 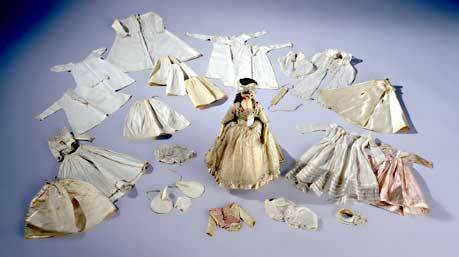 Another special doll, made around 1790, came with an extensive wardrobe, including everything from shift and stays to gowns and hats. Probably made in England, the doll is made of wood with glass eyes, painted facial features and jointed limbs. This is the first time this doll has been on display. Gretchen: Gretchen was a cherished member of the Clymer-Rumford family. Made in Philadelphia by the Greiner firm in the last quarter of the19th century. For over 100 years, she was passed down in the family until given to the Folk Art Museum. Photo: Colonial Williamsburg Foundation, Williamsburg, Va.
Doll: This doll, made around 1790, came with an extensive wardrobe including everything from shift and stays to gowns and hats. This is the first time the doll has been on display. Probably made in England, the doll is made of wood with glass eyes, painted facial features, and jointed limbs. Photo: Colonial Williamsburg Foundation, Williamsburg, Va. Trains have always captured the imagination of children and adults alike. This wooden train features railcars decorated with the names of rail lines from the northeast including New York and Philadelphia. Although there are no wheels on this train, the painted details give it a realistic look that would surely delight any young boy. In addition, several electric Lionel trains from the Carstens collection dating from the 1920s-1940s -- including the Blue Comet and the Flying Yankee – will be on view. Train: This wooden train features railcars decorated with the names of rail lines from the northeast including New York and Philadelphia. Although there are no wheels on this train, the painted details give it a realistic look that would surely delight any young boy. Photo credit: Colonial Williamsburg Foundation, Williamsburg, Va.
“A Child’s-Eye View” is on display in the DeWitt Wallace Decorative Arts Museum through May 2009. The Museums of Colonial Williamsburg are open to ticketed guests 10 a.m. to 5 p.m. Jan. 1- March 16, 2008, and 10 a.m. to 7 p.m. March 17-Dec. 31, 2008. Admission is by Colonial Williamsburg admission ticket, a separate Museums admission ticket, Annual Museums Pass, or Good Neighbor Pass. Entered through the Public Hospital of 1773, the Museums of Colonial Williamsburg are located at 325 W. Francis St. 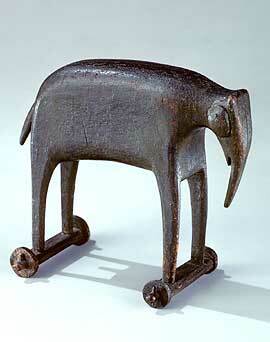 Elephant: This is one of a group of wooden animals made in Pennsylvania around 1850. The animal is hand carved and, although not greatly detailed, has a charm that no doubt delighted some lucky child. Photo: Colonial Williamsburg Foundation, Williamsburg, Va.
About the Colonial Williamsburg Foundation: Established in 1926, the Colonial Williamsburg Foundation is the not-for-profit educational institution that preserves and operates the restored 18th-century Revolutionary capital of Virginia as a town-sized living history museum, telling the inspirational stories of our nation’s founding men and women. Within the restored and reconstructed buildings, historic interpreters, attired as colonial men and women from slaves to shopkeepers to soldiers, relate stories of colonial Virginia society and culture — stories of our journey to become Americans – while historic tradespeople research, demonstrate and preserve the 18th-century world of work and industry. As Colonial Williamsburg interprets life in the time of the American Revolution for its guests, it also invites them to interact with history. Williamsburg is located in Virginia’s Tidewater region, 20 minutes from Newport News, within an hour’s drive of Richmond and Norfolk, and 150 miles south of Washington D.C., off Interstate 64. For more information about Colonial Williamsburg, call 1-800-HISTORY or visit Colonial Williamsburg’s Web site at www.history.org.